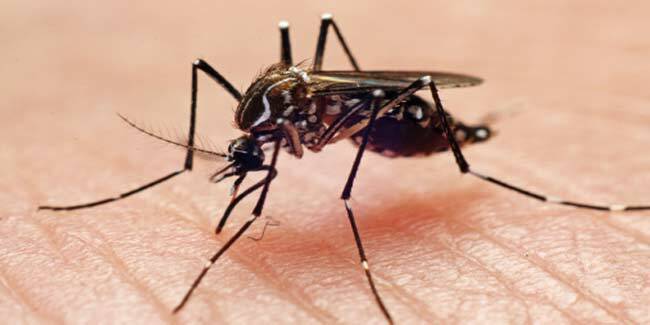 Dengue fever is caused by any of the four related types of Dengue virus. The disease is transmitted by bite of an infected Aedes mosquito. Mosquitoes spread infection to other individuals they bite. The virus multiplies in the infected person. Dengue fever is caused by any of the four related types of Dengue virus (DENV-1 to 4). One type of dengue virus can infect you only once. In your lifetime you can get infected by at least two if not all four types of dengue virus. The disease is transmitted by bite of an infected Aedes mosquito. Mosquitoes become infected while feeding on the blood of an infected person, and spread infection to other individuals they bite. An infected mosquito transmits the infection for the rest of its life when it bites a person. The virus multiplies in an infected person and an infected person is the source of the virus for uninfected mosquitoes. Dengue is not infectious from person to person. Only the female aedes mosquito bites and becomes infected after biting an infected person. The virus multiplies in the mosquito and the mosquito becomes infective approximately 7 days after biting an infected person. Aedes is a day biting mosquito and it’s peak biting time is at dawn and dusk. It can fly for a limited distance of 400 meters. It usually spreads over vast distances mechanically by the vehicles used by man. Aedes mosquito is a day biting mosquito with increased biting 2 hours after sunrise and a few hours before sunset. In the house it lives and rests indoor and is found in dark, cool places like in closets, under beds, behind curtains, and in bathrooms. Outside, the house it rests in cool and shady places. overhead tanks, open cement tanks, curing tanks. The female mosquito lays eggs in these clean water containers in and around houses and your neighborhood. The female mosquito lays eggs three times in it’s lifespan and each time it lays about 100 eggs. If the surrounding and atmosphere are compatible the eggs develop. The female Aedes mosquito becomes infected after biting an infected person. The virus multiplies in the mosquito and the mosquito becomes infective approximately 7 days after biting an infected person. The infection spreads when the infected mosquito bites a healthy person about 8-10 days after being infected. The mosquito remains infective for the rest of its life. The virus is transmitted from the mosquito when it bites a healthy person. The virus multiplies in the person and then he or she develops the symptoms when the virus has multiplied in sufficient numbers. The time taken from being infected with the virus to development of symptom is called the incubation period. The incubation period is about 4-6 days (average). So if proper measures are not taken to prevent spread of infection, dengue fever goes on in the community.